This quality track reached No.12 in the UK singles charts during February 1985, #5 in the U.S. (1984) and #1 in the Billboard Mainstream Rock Tracks Chart in 1984. The American musician was the founding member of The Eagles who broke up in 1980, leaving Henley to start a successful solo career in 1982. The Boys of Summer was the first track from the second album Building the Perfect Beast - the first album was entitled I Can't Stand Still. It was composed by Mike Campbell who was the guitarist in the band Tom Petty and the Heartbreakers. 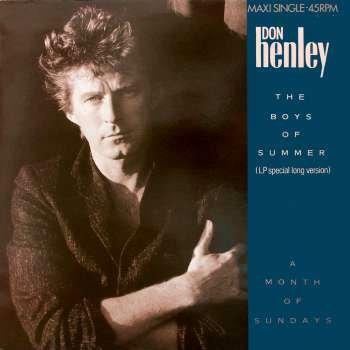 During the 80s, Don Henley released three albums and achieved seven Top 40 singles in the U.S. and five in Canada. His biggest hit was Dirty Laundry which topped the Canadian charts in 1982 and peaked at #3 in the U.S. Personally, I adore this track, although here in the UK it was actually a one hit wonder. However, a re-issue in 1998 reached #12 in the UK and #23 in Ireland. Another re-issue in 2009 reached #16 in Finland and #35 in Sweden.